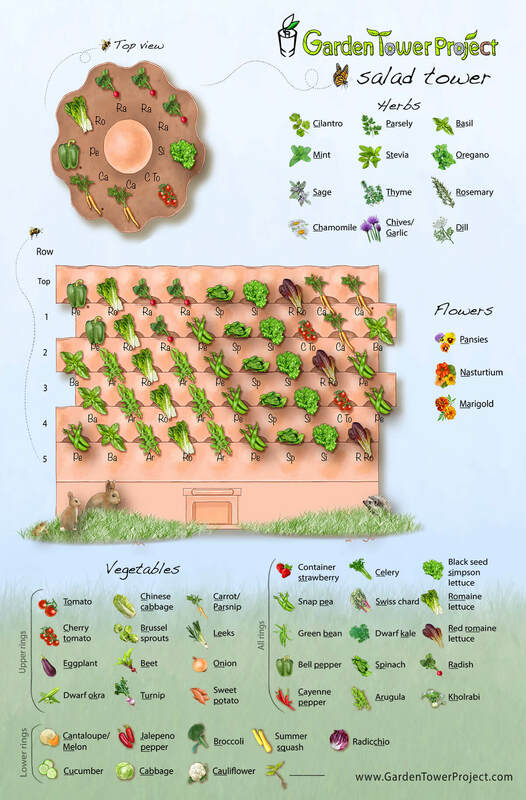 Below is a visual guide to designing your Garden Tower with a focus on salad veggies & herbs! 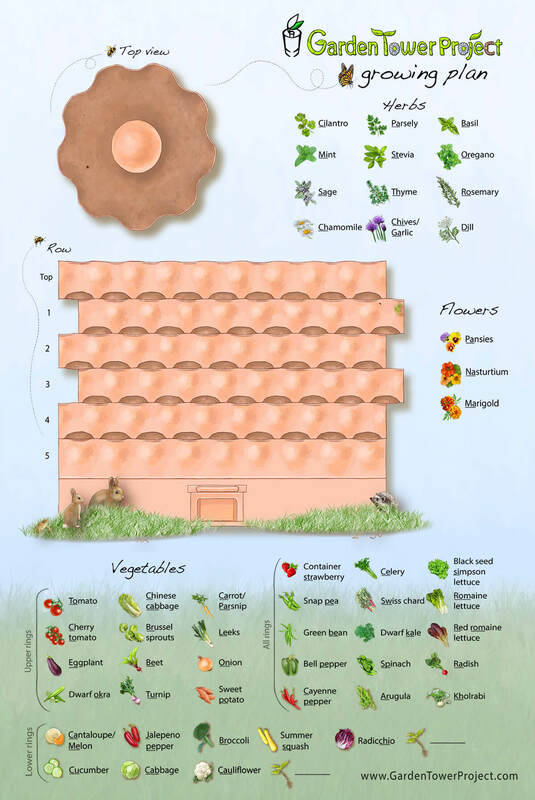 Due to many requests from gardeners, we’ve completed a Garden Tower planting design template and created an example “Salad Tower” using easy to grow, gourmet salad-appropriate plants that can be started from seed mid-spring. We paid attention to companion planting relationships in this design as well. However, most everything in this “Salad Tower” can be re-arranged without worry. Throughout the year we will post numerous requested garden designs from the brain-food garden to the perennial culinary herb special. We’re having fun with this! Download this model Salad layout in landscape or portrait orientation. Download this empty layout in landscape or portrait orientation. Tip: When designing, consider the days-to-harvest and growth form of adjacent plants. For example, you can grow loads of lettuce underneath a cabbage or tomato plant before the larger plant starts to shade the lettuce. 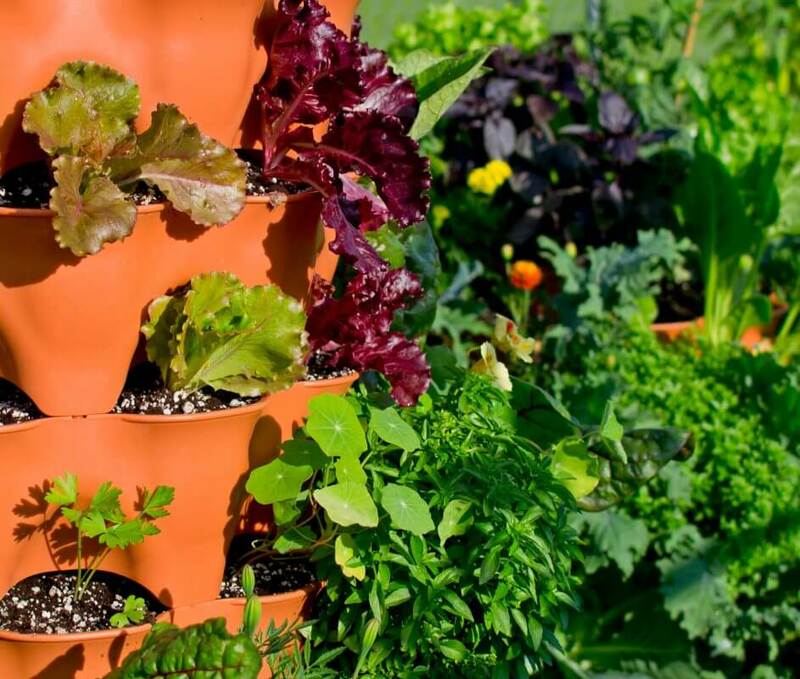 We suggest using quick growing greens around your larger, more slowly maturing veggies. Though it is absolutely not essential, you can maximize your harvests by paying a little attention to general companion planting suggestions. Happy gardening from all of us at Garden Tower Project! This entry was posted in Garden Tower, Gardening, Most Popular and tagged design template, Garden Tower, herbs !, Salad Tower, salad veggies.